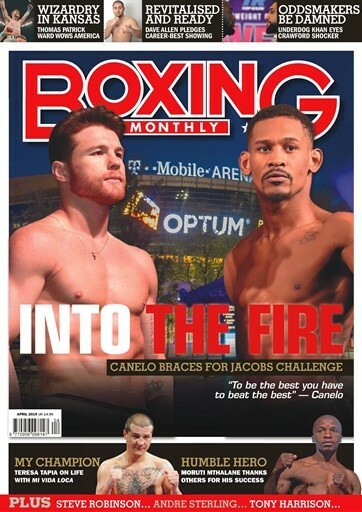 A subscription to Boxing Monthly is ideal for serious followers of the boxing arena.Boxing can be the most thrilling and demanding of sports and Boxing Monthly magazine gives it to you in full colour, no punches pulled.Regular features include a monthly round-up and reviews of any boxing related DVDs, films or books released that month along with sections dedicated to the domestic scene with reports and previews from the boxing beat in Britain.Boxing Monthly also includes interesting interviews with current and past boxers as well as catching up with retired champions who talk about life after boxing.The magazine was founded in 1989 and is the best British boxing magazine available. Boxing Monthly was the first British boxing magazine to go for the colourful, glossy look and feel of an American boxing magazine.Boxing Monthly magazine is full of blood, guts, intrigue and humour but above all it?s a bloody good read! • Your subscription will usually start with the next available issue and will not be the current issue that is available in the shops at the time of order. When Will I Start Receiving My Subscription? • As soon as you place your order we will take payment from you, email you a summary of your order and, pass your order to the relevant magazine publisher. • Once the publisher has confirmed the order (this may take up to 10 days) we will email you confirmation of this, along with delivery estimates for your 1st issue. • 13 weeks for Bi-monthly and Quarterly Publications. Orders for magazines printed outside of the UK may take an additional 2-3 weeks.